This post is about a portion of my recent trip to China. The main focus of this trip was collaborative ethnographic research in Guangxi Zhuang Autonomous Region, but other activities happened along the way. This post about the morning of December 8, 2017 and my companions for the day were two friends and colleagues–Dr. Carrie Hertz, Curator of Textiles and Dress at the Museum of International Folk Art and Dr. Jon Kay, Director of Traditional Arts Indiana and Curator of Folklife and Cultural Heritage at the Mathers Museum of World Cultures, Indiana University. After traveling from the U.S. to Beijing, our first morning in China was devoted to a visit to the Indiana University China Gateway Office, which is adjacent to Tsinghua University in Beijing. There we met with China Gateway Director Steven Yin and IUPUI Recruitment Coordinator and Assistant Office Manager Peter Wen. 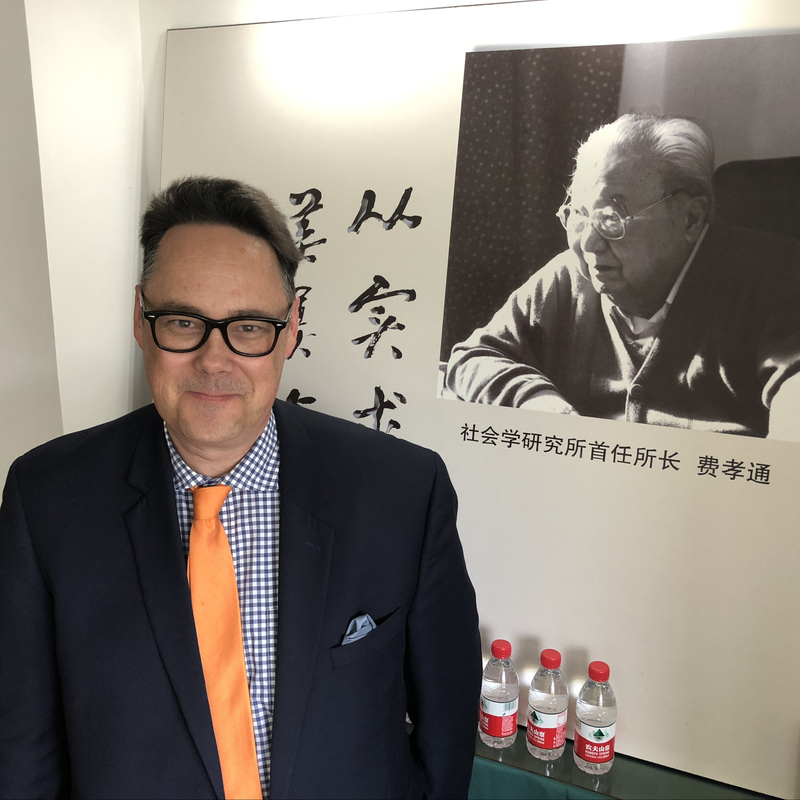 We spent some time at the Gateway discussing China-related projects (including our own) and then Peter walked us across the Tsinghua campus for our visit to the remarkable Tsinghua University Art Museum (TAM), where Steven had arranged for us to meet with colleagues and see the museum. (L-R) Indiana University China Gateway Director Steven Yin hosted Jason Jackson (MMWC), Carrie Hertz (MoIFA), and Jon Kay (MMWC) at the China gateway office in Beijing. December 8, 2017. China-related projects being discussed at the Indiana University China Gateway office. (L-R) Jon Kay, Jason Jackson, Peter Wen, and Steven Yin. December 8, 2017. Photograph by Carrie Hertz. IU Alumni (L-R) Jon Kay, Carrie Hertz, and Peter Yen (IUPUI Recruitment Coordinator and Assistant Office Manager at the China Gateway) pose with the IU Flag on the campus of IU partner Tsinghua University in Beijing. December 8, 2017. Photograph by Jason Jackson. (L-R) Jason Jackson, Carrie Hertz, and Peter Yen pose with the IU Flag on the campus of IU partner Tsinghua University in Beijing. December 8, 2017. Photograph by Jon Kay. An exterior view of the Tsinghua University Art Museum (TAM), Beijing, China. December 8, 2017. Photograph by Jason Jackson. (L-R) Jason Jackson and Jon Kay get their first glimpse of the Tsinghua University Art Museum (TAM), Beijing, China. December 8, 2017. Photograph by Carrie Hertz. An exterior view of the Tsinghua University Art Museum (TAM), Beijing, China. December 8, 2017. Photograph by Jon Kay. At TAM we met with Ge Xiuzhi from the research department and Wang Ying from the education and external relations department. They were generous hosts with whom we shared tea and luxurious visits to the museum’s spacious and beautiful galleries. Our interests gravitated to some of our favorite topics–textiles and dress, architecture, and furniture. Here are some images from “Architecture China,” an exhibition that tells the story of a group of vernacular architecture researchers while also introducing architecture students (and everyone else) to the key techniques in the national architectural tradition. Scenes from the exhibition “Architecture China: Specialized Exhibition of Tsinghua Construction Discipline” at the Tsinghua University Art Museum. December 8, 2017. Photograph by Carrie Hertz. Scenes from the exhibition “Architecture China: Specialized Exhibition of Tsinghua Construction Discipline” at the Tsinghua University Art Museum. December 8, 2017. Photograph by Jason Jackson. Scenes from the exhibition “Architecture China: Specialized Exhibition of Tsinghua Construction Discipline” at the Tsinghua University Art Museum. December 8, 2017. Photograph by Jon Kay. Scenes from the exhibition “Architecture China: Specialized Exhibition of Tsinghua Construction Discipline” at the Tsinghua University Art Museum. (L-R) Peter Wen, Carrie Hertz, Jason Jackson, Wang Ying, and Ge Xiuzhi. December 8, 2017. Photograph by Jon Kay. A key exhibition at TAM at present is a large overview exhibition titled “Tsinghua Treasures: Exhibition of Tsinghua University Art Museum Collection.” It is very large and presents a rich sample of the museum core collection. As reflected in this sample of our images, we devoted a lot of time to the textile section, which is rich in items of dress and adornment. Scenes from the textile portion of the “Tsinghua Treasures: Exhibition of Tsinghua University Art Museum Collection.” December 8, 2017. Photograph by Jason Jackson. Scenes from the textile portion of the “Tsinghua Treasures: Exhibition of Tsinghua University Art Museum Collection.” (L-R) Carrie Hertz, Wang Ying, and Peter Wen. Photograph by Jon Kay. Scenes from the textile portion of the “Tsinghua Treasures: Exhibition of Tsinghua University Art Museum Collection.” Photograph by Jason Jackson. Scenes from the textile portion of the “Tsinghua Treasures: Exhibition of Tsinghua University Art Museum Collection.” (L-R) Ge Xiuzhi and Jon Kay. December 8, 2017. Photograph by Jason Jackson. Carrie Hertz enjoys the textile portion of the “Tsinghua Treasures: Exhibition of Tsinghua University Art Museum Collection.” December 8, 2017. Photograph by Jon Kay. Scenes from the textile portion of the “Tsinghua Treasures: Exhibition of Tsinghua University Art Museum Collection.” Photograph by Jon Kay. We could have spent more than one day just studying the various sections of Tsinghua Treasures. We regretted neglecting some wonderful sections, including those devoted to ceramics, painting, and calligraphy. Scenes from the paintings and caligraphy portion of the “Tsinghua Treasures: Exhibition of Tsinghua University Art Museum Collection.” December 8, 2017. Photograph by Jason Jackson. Scenes from the paintings and caligraphy portion of the “Tsinghua Treasures: Exhibition of Tsinghua University Art Museum Collection.” December 8, 2017. Photograph by Jon Kay. Scenes from the ceramics portion of the “Tsinghua Treasures: Exhibition of Tsinghua University Art Museum Collection.” December 8, 2017. Photograph by Jason Jackson. Posing with an “IU Red” bowl in the ceramics portion of the “Tsinghua Treasures: Exhibition of Tsinghua University Art Museum Collection.” December 8, 2017. (L-R) Jason Jackson, Ge Xiuzhi, and Peter Wen. Photograph by Carrie Hertz. Scenes from the ceramics portion of the “Tsinghua Treasures: Exhibition of Tsinghua University Art Museum Collection.” December 8, 2017. Photograph by Jon Kay. We focused intently on the furniture gallery. As with the architecture exhibition, there were excellent hands-on educational stations in this gallery that helped one better understand the techniques and woods used in Chinese furniture. Scenes from the furniture portion of the “Tsinghua Treasures: Exhibition of Tsinghua University Art Museum Collection.” December 8, 2017. Photograph by Jon Kay. Scenes from the furniture portion of the “Tsinghua Treasures: Exhibition of Tsinghua University Art Museum Collection.” December 8, 2017. Photograph by Carrie Hertz. Scenes from the furniture portion of the “Tsinghua Treasures: Exhibition of Tsinghua University Art Museum Collection.” December 8, 2017. Photograph by Jason Jackson. Staff from the Tsinghua University Art Museum visited Indiana University during May 2017. On that visit I attended a presentation at the Eskenazi Museum of Art at which the Eskenazi staff (and I) were given a exciting overview of this new museum’s work and collections. It was wonderful to be able to follow up on this presentation and to see the TAM itself in the company of very generous hosts and my wonderful colleagues. A view of our group and the grand staircase at the Tsinghua University Art Museum. (L-R) Peter Wen, Ge Xiuzhi, Jon Kay, Carrie Hertz, Jason Jackson. December 8, 2017. Photograph courtesy of Ge Xiuzhi. Award Committee Chair Nora Pat Small recently noted for me the Paul E. Buchanan Award from the Vernacular Architecture Forum (VAF). What is so cool about this award is that it recognizes outstanding work in vernacular architecture studies that takes one of many forms that are NOT books or articles. Check out the award information page and the list of past winners. Then send your nomination materials to Professor Small at Eastern Illinois University. 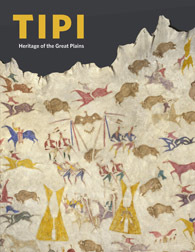 I am very pleased to note the publication of the exhibition catalog Tipi: Heritage of the Great Plains. This book has been published by the Brooklyn Museum in cooperation with the University of Washington Press on the occasion of an exhibition of the same name that has been organized by the Brooklyn Museum and that will travel to the Autry National Center for the American West in LA and the Minnesota History Center in St. Paul. It is a beautiful book on a topic that long been of scholarly and general interest. The project has been organized by and the catalog edited by Nancy B. Rosoff and Suzan Zeller of the Brooklyn Museum. I am taking special notice of the book here because it includes contributions from three of my close friends and collaborators. Daniel C. Swan and Michael P. Jordan (Sam Noble Oklahoma Museum of Natural History) have published a chapter titled “Tipis and the Warrior Tradition,” which focused on their collaborative work with Kiowa people and organizations and Christina E. Burke (Philbrook Museum) has published a chapter on “Growing Up on the Plains,” which explores child raising and associated material culture among the Native peoples of the Plains in the context of the tipi as vernacular architecture. Congratulations to Gabrielle A. Berlinger on the publication of her article “770 Eastern Parkway: The Rebbe’s Home as Icon” in Jews at Home: The Domestication of Identity, volume two in the Jewish Cultural Studies series edited by Simon J. Bronner and published by Littman. The book is beautifully made and carefully edited. Gabi’s article is a fine study of Jewish architecture in a complex context. Find the book on the publisher’s website here. Congratulations to Jon Kay, Director of Traditional Arts Indiana, who has been awarded the Warren Roberts Prize from the Pioneer American Society/Association for the Preservation of Artifacts and Landscapes. Learn more here.